The New Year 2011 starts with this Article by Sanjay Gavare. This film is "Durga Mantyat Mala" and the Role I played is of Shyam, I was lucky to play Double Role in this film one is Shyam and the other is of Dr. Vijay. Film has turned out to be nice and is releasing this week all over Maharashtra and then it will be released in Mumbai. I hope this film is liked by one and all. Efforts and Dreams of so many people are attached to this film. 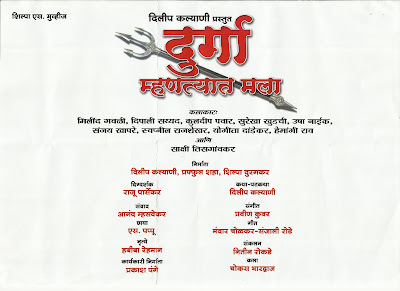 Labels: Milind Gawali Double Role in " Durga Mantyat Mala "